Charlie Adam believes limiting Gareth Bale's impact could be key to Scotland's chances against Wales in Friday's World Cup qualifier. 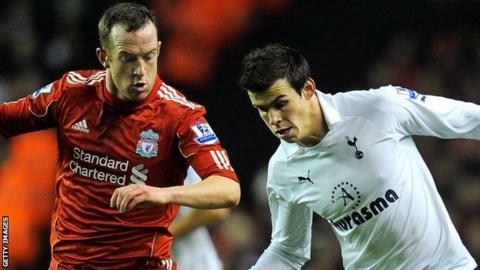 The two countries meet in Cardiff and Stoke's Adam, who was previously with Liverpool and Blackpool, is used to playing against Tottenham's Bale. "He's good and he's quick," said 19-times capped Scot Adam. "If we can stop him it will probably enhance our chances of winning the game." Bale has scored twice so far this season, playing an important part in Spurs' surge up the Premier League table. "I think he's one of the best players in the world, on his day," said Adam. "I don't think they [Wales] are a one-man team. They've got a number of players, like we have, who can win the game on their day. "Obviously [Craig] Bellamy's missing now, [Aaron] Ramsay's a top player, Joe Allen at Liverpool, so they've got players at big clubs. "We're confident we can go there and get three points and try to go to Belgium and get another three." but the 26-year-old has no concerns ahead of Friday's match. "He won't be playing on my side, whoever plays at right-back or left-back can deal with him," added Adam, who feels Scotland are unfortunate only to have two points from their opening two qualifiers. "We did perform to the way we can [against Serbia and Macedonia], sometimes that happens in games, you don't get the rub of the green. "If we get that in the next two games you never know where that could take us, where we could be finishing come next week. "I still think there's a lot of improvement in us, even though we never played too bad in the last games. "The quality that's come in can hopefully raise that again and we can get three points. "For us as players, it's good to have [Steven Fletcher] in the squad. "He's scored a lot of goals no matter what club he's gone to. To add that to what we've already got is very good for us."